YAZOO CITY, Miss. (AP) — Tornadoes ripped through the Southeast on Saturday, killing 10 people in Mississippi and injuring more than a dozen others. Roofs were torn off businesses, homes were splintered, vehicles were overturned and roads were blocked by toppled trees. Mississippi Emergency Management Agency spokesman Greg Flynn said five people were killed in Choctaw County, including two children. Four victims were in Yazoo County and one was in Holmes County. More than 15 other counties were also damaged. The swath of debris forced rescuers to pick up some of the injured on all-terrain vehicles the west-central part of the state. 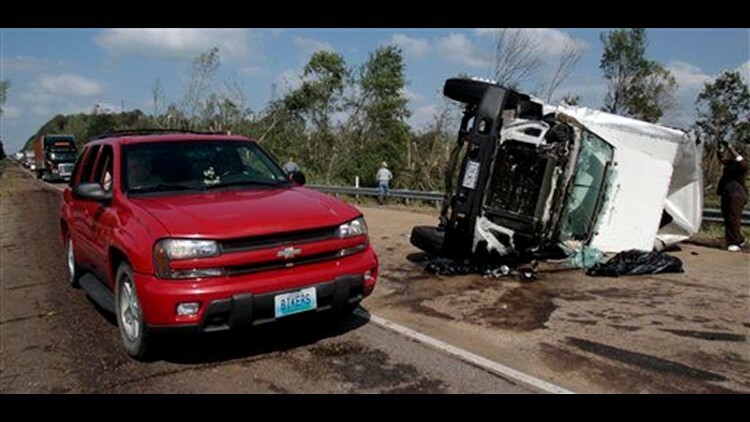 Tornadoes were also reported in Louisiana, Arkansas and Alabama, and the severe weather continued to track eastward. In Yazoo City about 40 miles north of Jackson, Malcolm Gordon, 63, stood with members of his family peering through a broken window. Above them, the roof was gone, a tree lay across part of the house and power lines stretched across the yard in a neighborhood made up of modest houses and mobile homes on a street that winds around hills and ravines. The smell of shredded pine trees hung the warm breeze. Gordon looked around at the devastation. "It sounded like a train coming down that road," he said. Gordon and his wife, Diane, hid in a closet while much of the neighborhood was blown away. "I'll just bulldoze what's left and start over," he said. Elsewhere, stunned residents stood on a hill overlooking the destruction. A National Guard helicopter sat nearby, and later took the governor on an aerial tour of the town he grew up in. "Sad, man," said 22-year-old Rafael Scott, shaking his head. "It's really hard to believe it. I heard they found a couple of bodies." Three broken crosses stood near a flattened church, and religious materials were scattered among twisted steel, broken wood and furniture. A nearby funeral home was reduced to rubble. In a patch of woods, pieces of tin were twisted high up in the broken trees. Josh Nicholson, 26, was driving home through the storm with his wife, 1-year-old son and 3-year-old daughter when a power line fell across the road in front their sport utility vehicle. "There was nowhere we could go," he said. Nicholson and his wife took the children out of their car seats and they all huddled in the back of the vehicle. All of the sudden, Nicholson said, the vehicle spun around and a tree clipped part of the truck where the 3-year-old had been sitting. Luckily, nobody was hurt. "It was scary," Nicholson said. Thousands across the state were without electricity, and downed power lines and trees blocked roads. At least four people had been brought by four-wheeler to a triage center at an old discount store parking lot, Yazoo City Mayor McArthur Straughter said as sirens whined in the background. Jim Pollard, a spokesman for American Medical Response ambulance service, said four patients from Yazoo County were airlifted and some 17 others were taken to hospitals. At least four people were in critical condition. Houston Astros pitcher Roy Oswalt, who pitched on Friday, was returning to Mississippi after a tornado damaged his parents' home in Weir, farther west of Yazoo County. Willie M. Horton, 78, said he hunkered down in the hallway of his house in Holmes County, which borders Yazoo. "Everything is down. A lot of trees. Big trees," Horton said. He said his sister-in-law's house nearby was damaged, and a nephew's mobile home was carried away by the storm. "My cousin — half his barn is gone," Horton said. The severe weather darkened skies and dumped rain on the region, much of which was under a tornado watch or warning at some point during the day. The weather hampered crews trying to clean up an oil spill after an offshore rig exploded earlier this week off the coast of Louisiana. Several sporting events and festivals also were rescheduled. In northeast Louisiana, several people had minor injuries. The storms also damaged a tank at a chemical plant in Tallulah, causing a small nitrogen leak. Associated Press writers Emily Wagster Pettus and Jack Elliot Jr. in Jackson, Janet McConnaughey in New Orleans and Jacob Jordan in Atlanta contributed to this report.